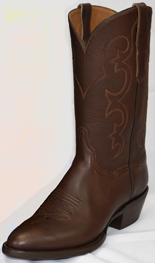 You've found a dealer that offers some of the finest Western Boots available. If you're familiar with Justin Brands, or Tony Lama, or Nocona, you understand the value that handcrafted boots can provide. If you're familiar with Lucchese Classic Boots, or Ammons Boots, or Black Jack Boots or Cultured Cowboy Custom Boots, you're familiar with the added comfort and higher quality levels of both craftsmanship and materials of a "Handmade" boot. If they are new to you, you have to try them to understand how truly great they feel. The boots are cut generously in size. They allow comfortable room for your arches. Until they break-in, they will slip on your heels. We're proudly showing our first group. A dressy top with a trucker type work sole. Non slip soles with extreme comfort. 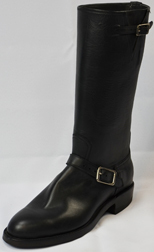 This boot has been in demand in a higher quality than is available from production models. Higher quality handcrafted bootmakers such as Justin have decided the numbers do not match their goals. They agree about a small need in our marketplace. Cultured Cowboy is trying to fill a void in traditional boots, made of the highest quality, in styles the mainstream companies find more difficult to fit into their production models. 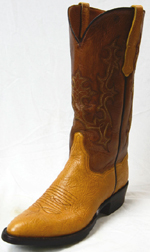 Why are cowboy boots divided into different categories? Aren't they all Western boots? Yes, in that Western is a lifestyle. But there are so many different facets within that lifestyle. Today, with advancements in technology, and foot science, there can be a more specialized selection from which you can choose. We know more about foot science than ever. Dr Rodney Candor and the UVA did a lot of work with how a cowboy boot can affect, even correct foot / gait issues and challenges. And other researchers have built upon those models. Even though leathers may look similar, a custom bootmaker blends types of leather, thickness of leather, parts of the animal from which the leather is made, for your best fit & function. For instance, on the vamp area, using leather is a given. But, using leather cut from center of the back toward the side of the animal produces a correctness in the grain and movement of the leather boot, as you wear it. 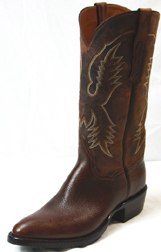 Production or handcrafted boots will take a hide and simply make best use of square inches. Handmades are cut for the function of the boot part, regardless of the waste. 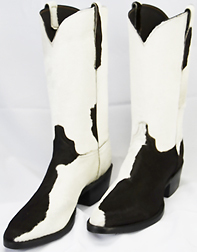 This makes for a lot fewer pairs from a cowhide in leather usage. Yet this cut makes the boot wear sooo much better! This is kinda like when wearing a "best" suit, a person was claimed to be "Dressed to the Nines". Nine yards of the finest fabrics were used to be able to match every seam, every pocket, every exterior detail, in a way that made that suit stand out among suits. Today, a fine 9 yard suit is in the $2500 to $4000 range. And only the finest tailors can produce such a suit. Similarly, with a handmade boot, many of the details are built inside the boot, as well as the fine craftsmanship on the exterior. So.... we spend how many hours in a work day? Why should we not invest in best footwear for support and comfort? How many days would you feel more like coming home to kiss the wife (hubby) rather than scowl, if your back, your feet, your whole body felt better? Are you aging? It's even more important to support those metatarsals and ligaments holding those foot bones together. Here's a start of our collection. From our "Trucker Boot" selections. Called Trucker boots because the heel counter is well attached to the rand for superb lateral support and the sole shown is Goodyear's best for flexibility and slip-resistance in a welted sole that can be re-soled. As an alternative, each can be made with either Vibram's Mini-Rib or leather soles. None are air blown nor injection molded! 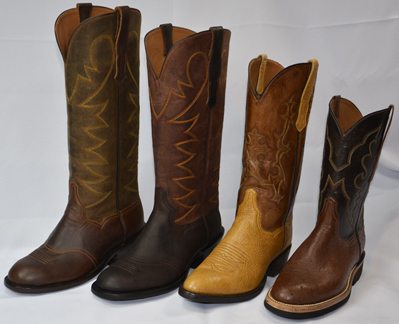 And now, more Exotic Western Dress Boots, Vibram Crepe Sole Ropers, Buckaroo Boots are here! Consider this quality for your wife and children too. (Ya do want more kisses, don't ya?) Especially during the growing years, the bones of the feet will form only as well as you allow. Proper care when young will pay tremendous dividends in all the years to come. 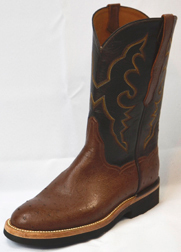 Please call for more information on any custom cowboy boot that you may be interested in. (even if it is not shown). Our next selections will be in more buckaroo styles and "Shooter's Boots", for Cowboy Action Shooters and SASS members. Another sorely needed category. And in Crepe Sole Westerners, which are so comfy on concrete surfaces & so popular among TechnoCrepe Boot fans. Ladies, we can make all these in your sizing too! Each style can also be made in ladies sizing too. 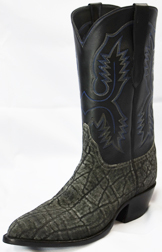 for selections of other exotic Western Boots, such as Elephant, Lizard, American Alligator, Nile Crocodile, Caiman, etc. We have enough Elephant to make 1 more pair. You choose toe & heel & height of boot! within 4 to 6 weeks. Several in stock Now! 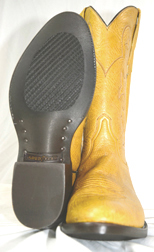 & SHOOTER'S BOOTS - 14 to 18 inch tops. Choice of toe styles, Choice of spur ridged heel heights. All over or complementary or contrasting tops. Choose your toe & heel styles.